Senior Bharatiya Janata Party (BJP) leaders on 25 July congratulated President Ram Nath Kovind on being sworn- in as 14th President of India. 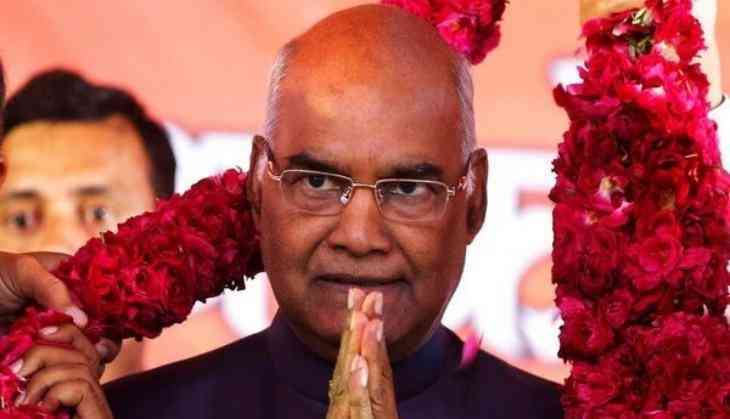 Minister of Road Transport and Highways of India, Nitin Gadkari expressed his happiness for President Kovind and said, "I had good experience working with him. , India will surely progress under his governance, who has come forward from the backward class. I wish him all the best." Maharashtra Chief Minister Devendra Fadnavis told media, " President Ram Nath Kovind has been sworn-in as the president today. I congratulate him for this. I believe that India would surely reach to new heights under his governance. Like Prime Minister Narendra Modi who is contributing to the growth of country, Kovind will also give his best in his tenure to upgrade India." Rajasthan Chief Minister Vasundhara Raje congratulated President Kovind on behalf of the entire state of Rajasthan. She said, "We have already given our well wishes to him when he came to Rajasthan for campaigning. All our MLAs have voted for him and I firmly believe that he would definitely work to the best of the country in his Presidential tenure." Gujarat Chief Minister Vijay Rupani also congratulated President Kovind and said, "The nation as a whole believes that he will surely serve as the President who will work for women, backward classes, poor, education sector and other sections of the society." Kovind was elected the President last Thursday as a ruling National Democratic Alliance (NDA) candidate. He defeated the Opposition parties' nominee Meira Kumar by a huge margin. President Kovind was administered the oath of office and secrecy by Chief Justice of India J S Khehar at the Central Hall of the Parliament in presence of outgoing President Pranab Mukherjee on the dais. Prime Minister Narendra Modi and his cabinet members, former President Pratibha Patil, former prime ministers Dr Manmohan Singh and HD Deve Gowda, Governors and Chief Ministers of various states attended the swearing-in ceremony.